A schematic and photograph of carbon-nanotube mode-locked high-repetition-rate femtosecond Cr:YAG laser. The compact Cr:YAG laser delivers 147 mW output power and 110 fs pulses at 550 MHz repetition rate near 1.5 μm. The femtosecond (fs) laser source with high average powers and high repetition rate (above 500 MHz) is very attractive for the applications like nonlinear spectroscopy and material processing. The femtosecond laser source with high pulse peak power and high repetition rate can increase pulse number in unit time. Both the signal to noise ratio in nonlinear spectroscopy and production of material processing can be substantially improved. Compared with the low-repetition-rate femtosecond laser source, the road to high-average-power and high-repetition-rate version becomes tough, as it requires more precise balance between nonlinearity of the gain medium, intracavity dispersion and the performance of saturable absorber. In particular, as small gain and low thermal conductivity of laser crystal, the Cr:YAG laser is quite sensitive to intracavity gain and loss, and the precise control to the parameters of saturable absorber is unavoidable. 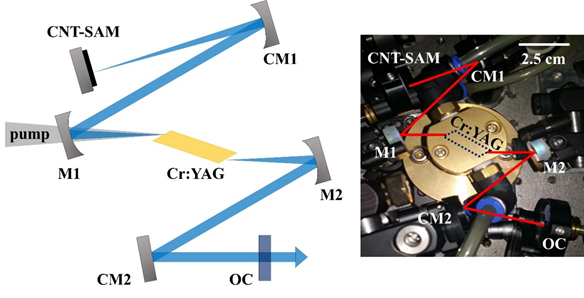 Recently, the researchers from the groups of Prof. Fabian Rotermund (KAIST, Korea) and Prof. Guang-Hoon Kim (KERI, Korea) demonstrated a carbon nanotube mode-locked compact femtosecond Cr:YAG laser with high repetition rate (>500 MHz). They fabricated a carbon nanotube (CNT) possessing 0.51% modulation depth and 28 μJ/cm2 saturation fluence near 1.5 μm. By employing the CNT as saturable absorber mirror (CNT-SAM), they realized the 1.5-μm stable mode-locked operation of Cr:YAG laser. To the best of the groups’ knowledge, the laser provides 147 mW output power and 110 fs pulses with the highest repetition rate among CNT mode-locked Cr:YAG lasers. These results are reported in Chinese Optics Letters (J. W. Kim et al., 550-MHz carbon nanotube mode-locked femtosecond Cr:YAG laser. Vol. 16, No. 6, 061404，2018). "A compact 1.5 μm femtosecond coherent source which delivers high average output power, short pulse duration and high repetition rate simultaneously can provide an efficient solution for a variety of applications in material processing and nonlinear spectroscopy." says Fabian Rotermund. Further work will be focused on the development of multi-GHz ultra-compact solid-state lasers, mode-locked by carbon nanostructures in various wavelength ranges.